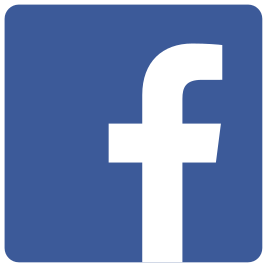 This gallery of equipment images is designed to help you identify types of trucks, trailers and other hauling equipment, past and present, that are commonly used in construction and surface mining. 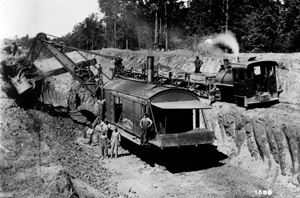 Dump car: Used with the first steam shovels, railroad cars were the first haulers. Narrow- and standard-gauge trains were used in many construction applications until the advent of the truck. Dump wagon. The stock-drawn dump wagon also came into use in the mid to late 1800s where trains were impractical. The bottom opened to dump the load on most wagons. These too were replaced by trucks. 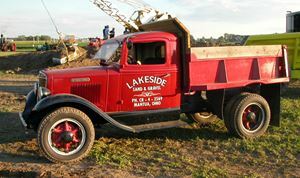 Dump truck: 1936 International C30. As motor vehicles were perfected, it was only natural that dump trucks should replace trains and stock-drawn wagons. Dump truck: 1961 White Super Mustang. Heavier loads require more tires on the ground to carry it. This tandem-axle truck carries up to ten cubic yards. 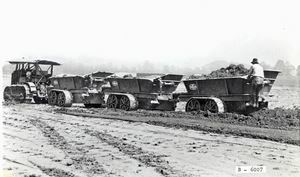 Crawler dump wagon: The first mechanized off-highway haulers were wagons that were used behind crawler tractors starting in the early 1930s. They could roughly 10 cubic yards each. End dump truck: Euclid 46TD. Purpose-built off-highway end dumps were invented in 1935. 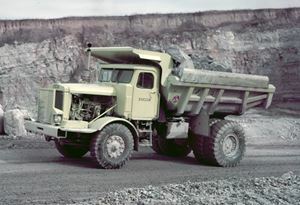 This 1950s model carried 22 tons; trucks for construction and quarrying are usually rated under 100 tons. 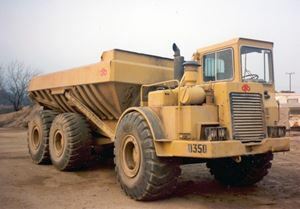 End dump truck: c. 1997 Cat 797B. End dumps used in mining are quite large. 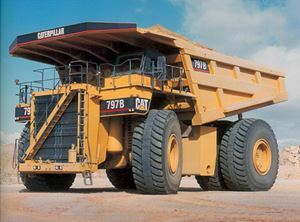 The Cat 797B, for example, had a working weight of 687.5 tons and was rated at 3,550 horsepower and 380 tons capacity. End dump trailer. 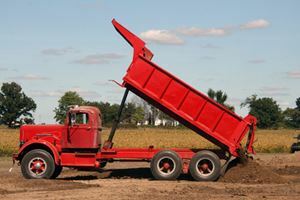 Dump trailers were first used behind truck tractors in the 1930s. They work the same as dump trucks, but can carry larger payloads; indeed, a dump truck can pull one too. Rock wagon: c. 1960 LeTourneau-Westinghouse D Rocker. 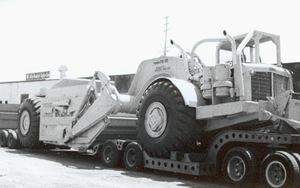 From the 1940s through 1960s, the prime movers that pulled scrapers were often hitched to rear dump wagons instead to haul and dump rock. Articulated dump truck: DJB D350. The articulated dump truck resembles a prime mover and rock wagon, but it’s built as a complete unit and all wheels are powered. The largest carries 55 tons. Bottom dump truck: c. 1941 Euclid FDT. 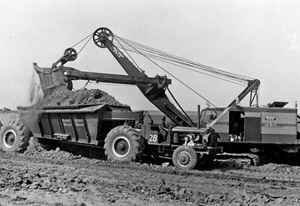 Invented in 1935, the off-highway bottom dump truck was much larger and faster than horse-drawn or crawler wagons. Capacity ran from 13 to 100+ cubic yards. 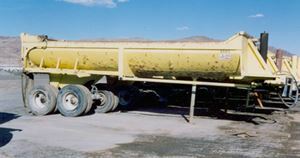 Bottom dump trailer: After World War II, the bottom dump concept was adapted for use over the road behind truck tractors. Typical capacity was 12 to 24 cubic yards. Bottom dump train: This consists of two trailers, often matched to a loader’s bucket capacity so that each can be loaded in one pass. Far larger off-highway trailers can be run in tandem as well. Coal hauler: c. 1957 Dart 50SBDT. Otherwise similar to a bottom dump truck, the coal hauler’s trailer carries a larger volume load because coal weighs less per cubic yard than does dirt or rock. Compact hauler: c. 2007 ASV ST50. 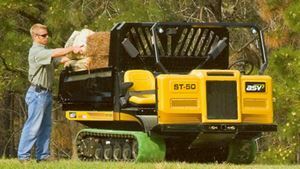 Small tracked and wheeled vehicles can be set up with a variety of bodies and attachments to haul dirt and move materials in remote or confined areas of the jobsite. Water wagon: 1964 Peterbilt. Construction sites are dusty. Along with settling the dust, water also helps compact the ground. The “water wagon” dates from the days of stock-drawn sprinkler wagons. 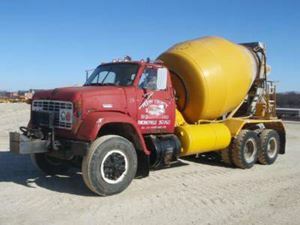 Water wagon: 1968 International 100B. 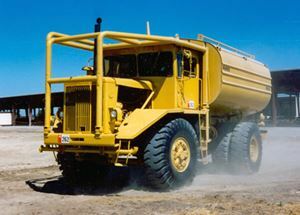 Some older off-highway trucks are also converted into water wagons by replacing the dump bed with a water tank. 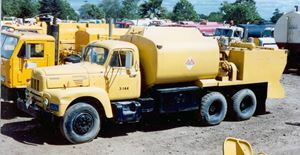 Water wagon: 1958 Cat DW21 with Miller & Smith tank. Some water wagons are converted from motor scrapers, or use scraper prime movers. These rigs usually carry 5,000 to 12,000 gallons of water. 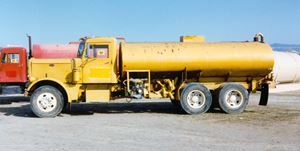 Rear-discharge transit mixer: GMC 9500. In the 1920s, the transit mixer was developed by mounting a concrete mixer onto a truck. The mixer is powered by the truck’s engine, or its own. 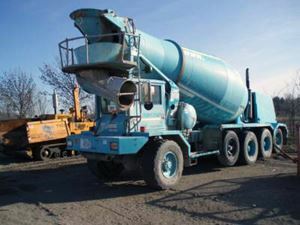 Front-discharge transit mixer: Starting in the 1970s, the transit mixer’s design was reversed so that the concrete was discharged from the front of the truck, in plain view of the operator. Boom truck: 1950s Ford C600. 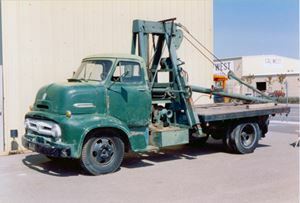 Since the 1920s, lifting booms and small cranes have been fitted to trucks to create highly mobile rigs to make lifts in the field at less cost than a full truck crane. Service truck: 1965 International RDF190. Construction and mining machinery has to be serviced where it works, and a wide variety of trucks fill this need. This one dispenses fuel and lubricants. Lowboy trailer. 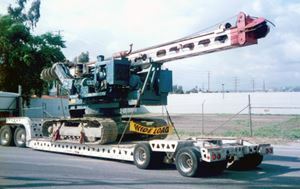 A lowboy has a depressed deck and can carry hundreds of tons. 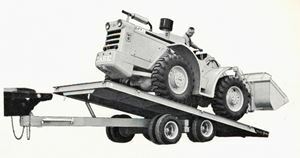 Depending on the design, it can be loaded from the front or rear, or it can pass under the load and lift it for travel. Scraper dolly. Lowboy trailers are used in a wide range of configurations. This setup transports a motor scraper by carrying each axle under its own dolly, with the scraper itself connecting them. Tilt trailer: c. 1967 Miller OT 24,000 Lb. Tilt-Top with Case wheel loader. A tilt trailer’s deck tilts down for loading, then levels itself for travel by gravity under the weight of its load.